The average cost of memory care in York County is $5,710 per month. This is higher than the national median of $4,650. Cheaper nearby regions include Dauphin County with an average starting cost of $3,040. York County is home to almost 450,000 people, and 17.1 percent of the population is aged 65 and older. People in this age bracket are most likely to develop Alzheimer's disease and related dementias. The Alzheimer's Association estimates that the disease affects more than 400,000 Pennsylvania citizens. An estimated 11.6 percent of the state's population has dementia and could benefit from an Alzheimer's Special Care Unit (SCU), as they're called in Pennsylvania including York County. These units are licensed by the Office of Long-Term Living. York County's climate is almost the same as the national average with 43 inches of rain, 25 inches of snow and 199 sunny days as compared to 39, 26, and 205, respectively. Summertime highs stay in the mid-80s, and wintry lows only drop as low as 22 degrees. The county's Sperling Comfort Index is 49, which is five points lower than the national average. Seniors' families might want to ask facility staff about procedures in place to protect their residents from harsh weather conditions. York County's violent crime rate is only a few points above the U.S. average of 31.1, and the property crime rate is eight points lower than the national norm. SCUs have additional layers of security in place to prevent residents from leaving the facility and to stop unwelcome guests. The air quality in York County is poor, according to the American Lung Association, which gives the area a "B" grade for particle pollution but an "F" for high ozone. This may affect seniors with pre-existing lung disease, such as asthma or lung cancer. Retirement income is tax-exempt for residents 60 and older in Pennsylvania, including pensions, retirement accounts, and Social Security benefits. Pennsylvania's sales tax is low as well, which may lessen the tax bill for seniors, allowing families to budget more money towards memory care. Memory Care costs in York County start around $5,710 per month on average, while the nationwide average cost of memory care is $4,799 per month. To see a list of free memory care resources in York County, please visit our Assisted Living in Pennsylvania page. 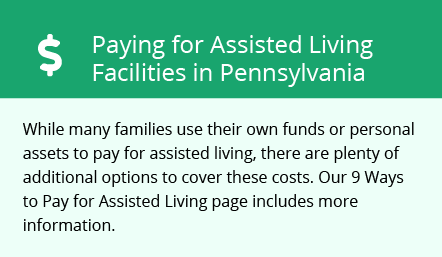 York County-area assisted living communities must adhere to the comprehensive set of state laws and regulations that all assisted living communities in Pennsylvania are required to follow. Visit our Memory Care in Pennsylvania page for more information about these laws.